It had been awhile since I read The Riyria Revelations series, but when I started reading this book I felt as if I was back among old friends. The Riyria Chronicles takes us back to a time before The Riyria Revelations. We find out how Hadrian Blackwater and Royce Melborn first met (a lot of head-butting going on there!). We also get more history on Gwen DeLancy, who is another beloved character. 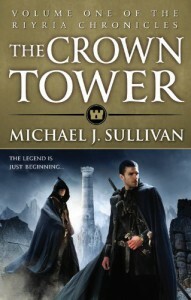 If you haven't yet read either series, Michael Sullivan has written the books so that you can read them in any order. My personal preference is to read them in order of publication. Seeing how the characters started out after knowing how they ended up, made this book that much more enjoyable for me. I felt that I had a deeper connection to them. But either way, I can't see anyone who has read them not being a fan. Michael Sullivan has definitely become a favorite. I enjoy the depth of his characters so much and I really care about them. His books are well-written, evenly paced and they draw you in so that somehow you feel like you are right there on a great adventure with these characters. That's an art!